The hand is the instrument of the brain. All practical life exercises have a purpose that lead to muscular development and self-discipline, self-sufficiency, and concentration. Once a child learns to focus then concentration begins. The Practical life exercises relate to areas such as grace and courtesy, elementary movement, care of self, care of environment. The young child is sensitive in acquiring a language, which connects with his sensitive periods during the ages 3-6. 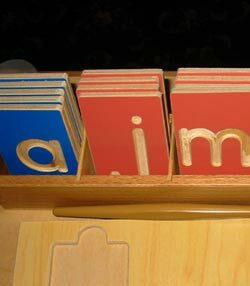 Children learn language through Insets for Design, Sandpaper Letters, phonetic sounds, the shapes of the alphabet, phonetic words: 2 or 3 letters, then 4 or more phonetic words, parts of speech grammar. In our 3 years program, children learn from concrete to abstract, simple to complex, They learn count 1 -10, 10-90, 11-99, 100, then are taught hundreds to thousands, and moved into addition, subtraction, multiplication and division with notation. This is for children enrolled in over 3 year program. History: Gives the child concepts about what happened before the beginning of the world and also teaches the analysis time. The child begins to understand human life and develops an appreciate of where we live. Geography: The jigsaw map of the world helps children to identify seven continents and oceans. Geography also introduces children to the three elements: air, land and the water. It also teaches children the fundamental needs of people. Through science experiments the child discovers about air, the five senses, magnetism, sound, the solar system and so on. Here the child will be able to create art projects which may include clay, drawing, and special designed crafts. Child sings songs in our circle time, and enjoys musical finger-plays and action music games. Children also learn science, geography and vocabulary through musical songs. Through activities with our Mandarin teacher the child learns vocabulary and greetings. Child practices math, language and language sequencing from our computer. Also we can explore the world through our over-head projector video lessons.